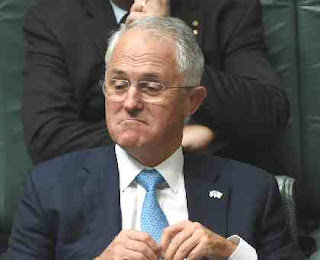 Australia's Prime Minister, Malcolm Turnbull, is blowing out of his rear end again. You may say he is a dreamer with the quickie ideas he comes up with. I call him a stupid hairhead. He says such silly things like this country becoming a leading world arms supplier and willingly handing over funds, while considering stopping unemployment benefits for all people under 30 years of age. His theory of the trickle down effect has been proved not to work. Giving tax cuts to the already wealthy never puts money into the pockets of the working poor. The rich just hide more of their ill-gotten gains in the West Indies as the PM has done himself. He has no understanding of economics. You get to be a "successful" businessman like him by skimming off the income of others. Somehow you find a way to charge more for the goods you sell. You can also do this by stealing from your employees. Something that the turning bull has done himself. Getting back to his latest idea. How can Australia be a major exporter of military hardware when we buy nearly all of our weaponry from the United States. Yes, he has admitted that we will not be selling tanks or aircraft. This nation will make state of the art operational equipment. That is a very broad term. Aussieland is in the same basket as New Zealand and Canada, little players with not much to offer. High labor costs make manufacturing here unprofitable. Plowing millions into trade shows when all you have to display is the Bushmaster troop carrier is crazy.